It was almost time to say good bye to Mumbai. After enjoying a scrumptious meal, it was time to eagerly wait for my ride back home. This ride was very special as I had planned for quite some time to try this operator. While booking the tickets, I had made a rookie mistake of choosing an incorrect boarding point. Probably it may be because I always board the bus from Borivali, I forgot to select the correct boarding point as Chembur. I got a call at around 3:15pm asking if I was at Gokul hotel in Borivali, I apologized and informed the pickup man that I was at Chembur. The pickup man acknowledged and stated to stay there and it would take almost an hour to reach. Knowing Mumbai and its traffic very well, I doubted his claim however I was not going anywhere. 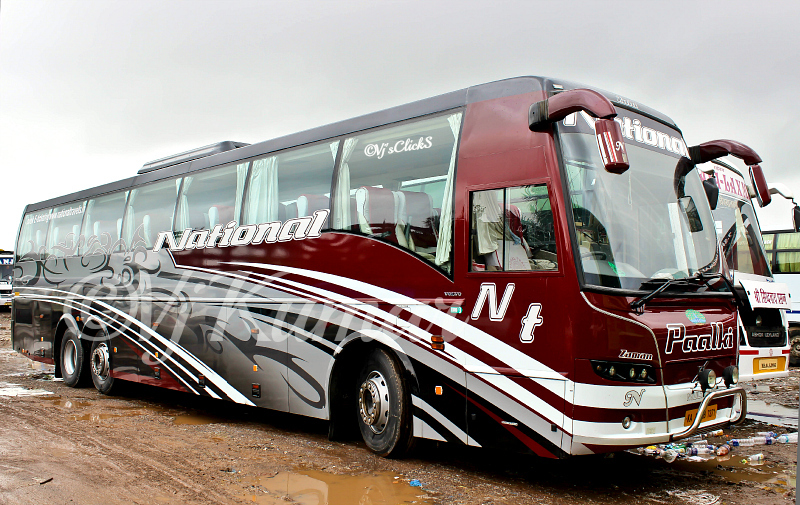 National travels is a veteran operator on this sector and their operations to Mumbai goes a long way back. 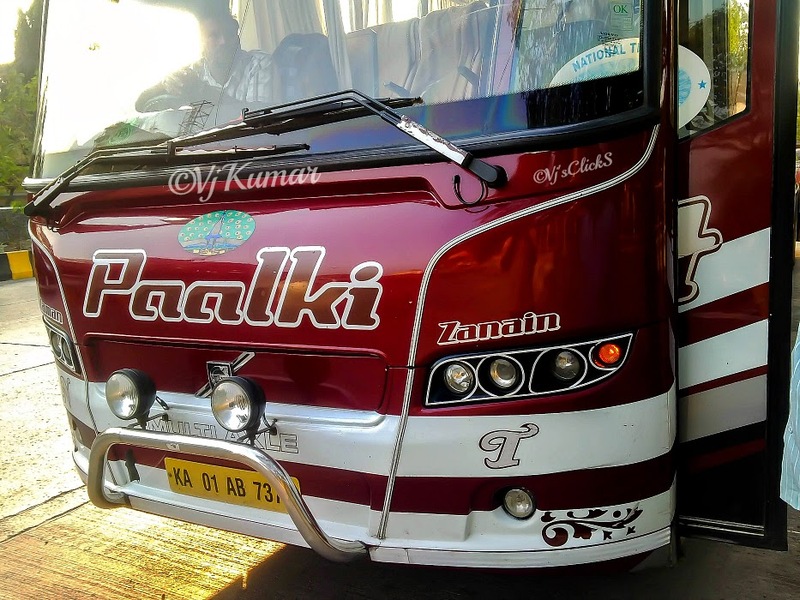 Their buses are always a talk of the town and their livery and upkeep always grabs the attention of both the passengers and the people on the streets. Time flew by quickly and at around 17:15hrs, the bus honked and pulled over at Chembur. The very sight of the bus was appealing and was all set to begin my journey. I bid good bye to my friend and took my seat (#1) and settled down. Since this was my first journey in National, I did not want to miss any moment of the journey. Around 6 passengers were boarding at this point and no sooner we boarded the bus, the pickup man signaled the driver to move the bus. The cleaner handed out 1ltr water bottles for all Bangalore bound passengers. Very few operators apart from KSRTC hand out water bottles on their buses. I remember Sharma and Kallada National giving out water bottles when I traveled with them a year ago. We reached Vashi and pulled over for a Bio break. 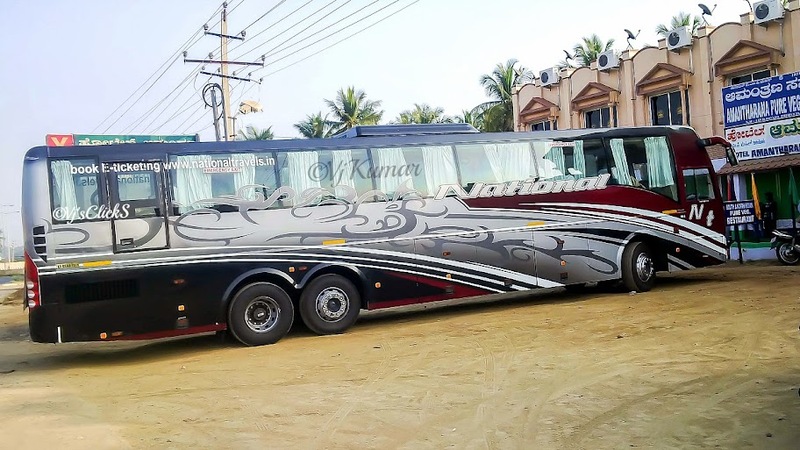 I glanced at the trip sheet and found around 26 passengers had boarded the bus from different points in Mumbai which started from Mira Road and the rest from Pune. The bus was already half full. We moved towards Panvel and picked up few Pune bound passengers. We joined the Expressway and I was waiting for the driver to unleash the power of B9R. However, the bus continuously maintained speeds of 90-95kmpl. The driver let the quick moving cars and went in for gaps with caution. While we cruised on, a Mangalore bound Anand Sleeper joined us. He quickly overtook us only to be chased down after a couple of miles. Both the drivers exchanged smiles and honked before my guy overtook him. A fairly new Bollywood movie was played on the entertainment set. The volume was kept low ensure no disturbance was created for passengers who wanted enjoy a quiet nap. We reached Pune and as always traffic greeted us. After dropping few passengers at Hinjewadi, we headed to their office at Katraj. We waited for almost 25minutes for the pickup van to show up. I spoke to the crew and they said that he has spotted people clicking pictures on the highway and initially they were not sure why. However, now most of their crew are aware of our hobby and are happy to know that we respect their profession. Yet, he was equally disappointed that not many respect them as their profession is still looked down upon in our country. While we discussed about National and its future ventures, the pickup van showed up. After checking in the new set of passengers we were all set to join back the highway. 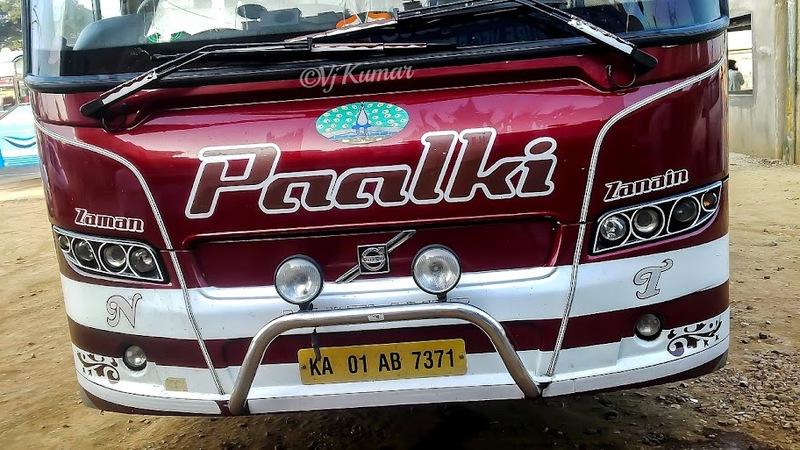 We moved out of Katraj and barely traveled for few mtrs when a passenger from the rear hurriedly made his way to the front and requested the driver to stop the bus. Upon inquiring, he said that he might have dropped his cellphone in the pickup van. We pulled over and called up the pickup van driver and the search was on. After 10minutes, the pickup van driver called up and said he was unable to find the mobile. The passenger was quizzed again and later he realized that he must have left it in his office and got off the bus saying the cellphone has all his contacts and can’t afford to lose it. After losing around 20minutes in the confusion we resumed our journey. The crew was a little miffed as a lot of time was wasted because of all the confusion. We resumed our journey and I was eager to see the bus pull over for the Dinner break as hunger had crept in. After 30minutes into the journey the bus pulled over at the usual Hotel Natraj. 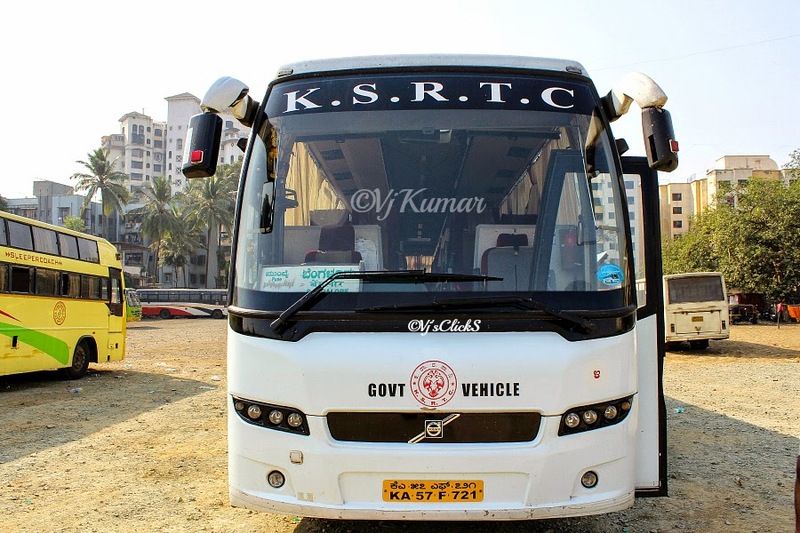 Here a Depot 4 beauty of KSRTC welcomed us. This was the same bus which I had traveled in the recent past. After enjoying my dinner, I met the crew of the D4 beauty who were surprised at me for not booking seats on their bus. The crew knew that I was aware that they will be available on the particular trip. They pulled back from the parking and watching the bus leave made me realize how much I adore these D4 beauties. Few minutes later it was our turn to join back the highway. The crew was again courteous and checked if everyone had their stomachs filled. While we began to pull out, a Sharma B9R sleeper pulled in. We resumed the journey and finally it was time to bring the curtain down of what seemed to be a long and tiring day. The comfort and sedate driving put me to sleep in no time. I woke up only once to find the bus in Hubli toll and slept off again. It was around 7:30am when I woke up to find the bus in Hiriyur. The bus pulled over for a breakfast stop and the crew called out loud stating ‘15minutes for fresh up and Breakfast’. With great difficulty I got down and enjoyed a cup of tea. Since, Bangalore was another 2-3 hours away, I was in no mood to miss the Brunch at home. A couple of minutes later, we were joined by the same Sharma Sleeper and soon the place was crowded. After 30minutes, we joined back on the highway and the driving again was very sedate. No honking or sedate braking. We coasted smoothly on the highway and reached Tumkur. We pulled over to drop off a passenger. My eyes were now battling a heavy sleep and soon I gave up. When I woke up, we were just lining up behind a KSRTC saarige at Nelamangala toll. I resumed my sleep again though I knew my alighting point was another 15-20minutes away. When I woke up, the bus was getting down the flyover. I quickly grabbed my luggage and got ready to get down at Yeswanthpur. 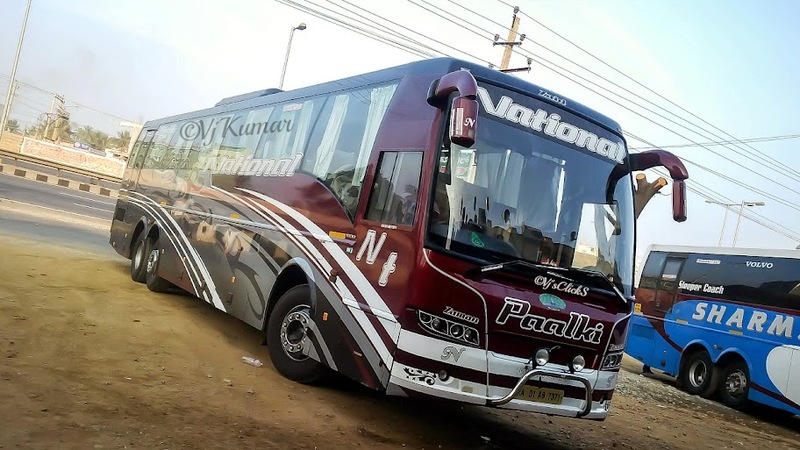 At 10:32 am my first journey with National travels‎ ended. The driver gave a warm smile and asked me to try their service again. Will I try their service again? Since I had read few reviews of National, I knew what was in the offering. Friendly crews, a superbly maintained bus, sedate and comfortable ride is the perfect recipe for any bus journey and National had it all. I will certainly try their service again.